An oasis for wanderlust souls, who revel in its old world charm. The golden beaches, the glorious sea food, the refreshing culture and the bohemian vibes……. this tourist destination is not only a great vacation spot. Every year hundreds of free-spirited souls from across the globe visit the town to enjoy the soothing weather and have the time of their lives. Negombo has introduced many well-known hotels and restaurants that cater to the needs of the many travelers coming into the town, leading to a rapid development in its travel and tourism sector. As the demand for beach properties escalates, it is easy to observe a rapid improvement in the real estate industry within the Negombo region. Negombo holds some of the most fascinating historical records on the island. The name Negombo is derived from “Meegamuwa” used by the locals. Meegamuwa means the village of honey and it is believed that a swarm of bees landed to the island on a boat. This location is now called Negombo or Meegamuwa. The Dutch grew a strong interest for the town once they found that spices like cinnamon grew wildly in its jungles. Thus trading cinnamon became one of the most important businesses led by the Dutch. The town was captured by the Portuguese after defeating the Dutch in 1644 and subsequently invaded by the British. However, later a warrior clan from India established the fishing industry here and at present Negombo is home to the most important fishing port on the island. The old Portuguese style Roman Catholic churches, boats painted bright colours and with fancy names, docked beside the sandy Negombo beaches, children and adults of all ages spending their time flying beautiful kites, travelers dressed in Sri Lankan batik garments walking and exploring freely around the town, the fancy souvenir shops with traditional Sri Lankan ornaments and clothes, and the chain of beach hotels and restaurants that offer the best sea food, are just some of what make Negombo the ultimate travel destination. Traditionally, travelers who arrive to the country are interested in spending their first night in Negombo relaxing by the beach, due to its convenient location close to the country’s international airport and just 35km away from the commercial capital, Colombo. Visit the Dutch canal and the colonial churches. Enjoy boat trips on the lagoon or along the canals that flow through the town. Enjoy spicy Sri Lankan street food by the beach. Fly kites and enjoy the magnificent sunset that will take your breath away. Purchase ornaments, postcards, batik clothes and souvenirs at the local souvenir shops on the streets. 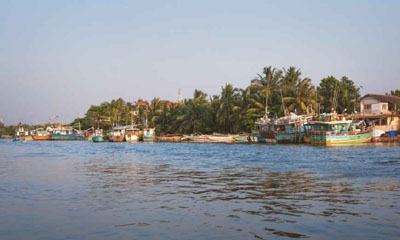 Since Negombo is a fishing town, there is fresh sea food, lobsters, prawns and cuttlefish aplenty, loved by locals and foreigners. The sea food joints and restaurants along the beach road, serve the best sea food in the town and are complimented by the many pubs along the beach road, offering an enjoyable time to anyone visiting the area. Some of the famous places for sea food are Fish and Lobsters, Dolce Vita, King Coconut, and Serendib. However, there are also other places for different cuisine such as Sushi Bar, etc. Negombo is home to a variety of residential properties ranging from luxury to mid-level. As far as trends in renting and purchasing houses goes, locals and foreigners tend to rent out houses rather than buy them, since tourists are here only for a short period of time. Therefore, renting houses is a more popular choice. One of the main advantages Negombo has to offer its residents, is its highly convenient transport links. The expressways that link-up Negombo with the commercial capital of the island, make it easier for people to travel in and out of the town easily. Residential property and land prices in Negombo are much lower when compared to Colombo. This has attracted developers and investors, encouraging them to develop luxury houses and hotels within the town.